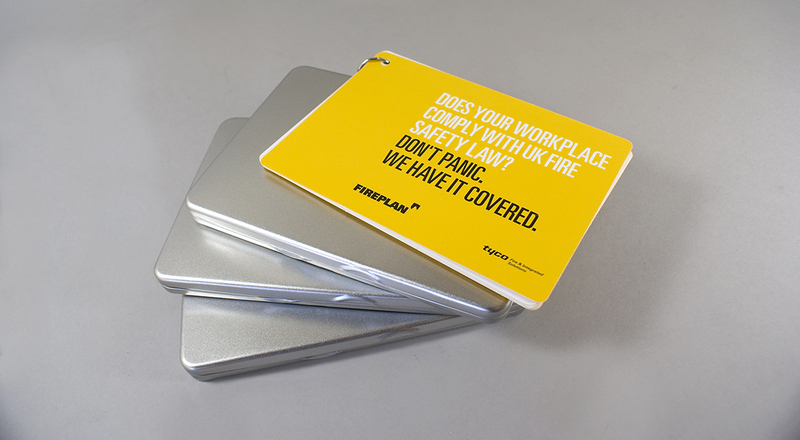 Tyco tasked Reform with the branding and marketing tools for the launch of the new product FirePlan conceived by Tyco. Elements included: branding, branding guidelines, direct mail, micro-site and welcome pack. The target audience for the new FirePlan product was UK-wide new businesses with 5+ employees across all industry sectors. FirePlan is a simple, cost-effective solution for new business owners to ensure their premises meet the minimum requirements of UK fire safety law. It is often the case that when a new business starts it is inundated with organisations offering many services. With this in mind, Reform knew that the direct mail piece would have to stand out from the crowd and immediately engage the recipient. A simple brochure, leaflet or flyer would not have the desired effect. Reform produced a set of 10 cards bound with a binding ring to the top left. An illustration element was introduced to support each message. This was done in the ‘how do, health and safety’ style. The direct mail piece was copy-light with a strong call to action to visit the site or to buy the product. The cards were packaged flat into silver tins with the logo embossed on the lid. The packaging reinforced the idea of safety.